What the heck are we talking about here? A couple of engineers (literally, they’re married – they’re a couple of engineers, get it?) received a grant to come up with a solution to using asphalt to pave our roads, sidewalks and playgrounds. And, oh, what a solution they came up with. 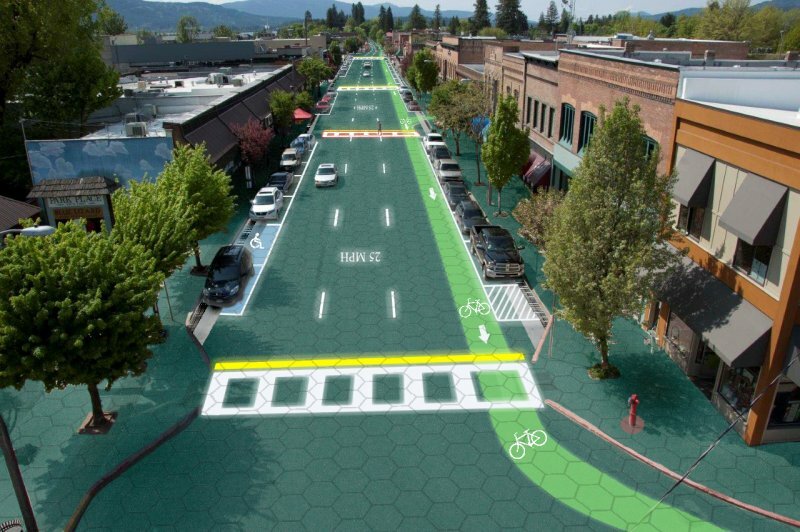 By using a special tempered glass, they created a surface as strong as asphalt that allows for solar panels to be installed underneath, effectively converting the United States’ entire roadway system into a solar power factory. The engineering couple projects that if every roadway in the United States was replaced with solar panels, the roadway would create THREE times the power the U.S. currently uses! That, alone would be transformative. Also, LED lights embedded in the glass will allow roadways to “self-paint” their own lines and alert driveways of oncoming obstacles (TREE!) so we wouldn’t need to paint our roads anymore. In addition, playgrounds and parks can be reconfigured into basketball courts, tennis courts, four-square, ball hockey – whatever you can imagine – plus, THEY GENERATE SOLAR ENERGY, TOO! This idea is truly paradigm-shifting and you don’t need to take our word for it – check out this amazing YouTube video below for more details and then run over to the couples’ Indiegogo page to donate, but be quick with the whipping out of your credit card – you only have until May 31, 2014 so donate quick! Got any other great ideas to truly change our beloved Stumptown? Leave ’em in the comments, eh?